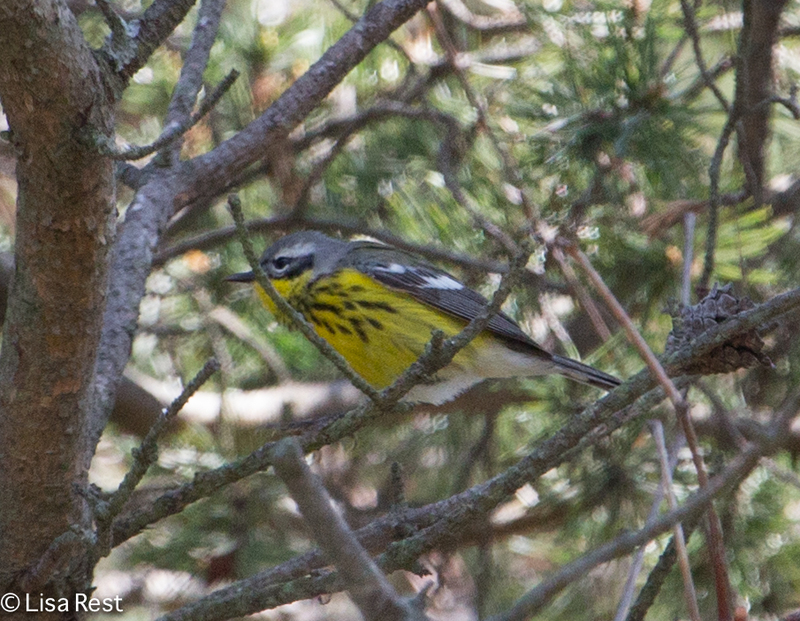 I think I have finally been through all the pictures from the Memorial Day Kirtland’s Warbler weekend with the Chicago Ornithological Society. 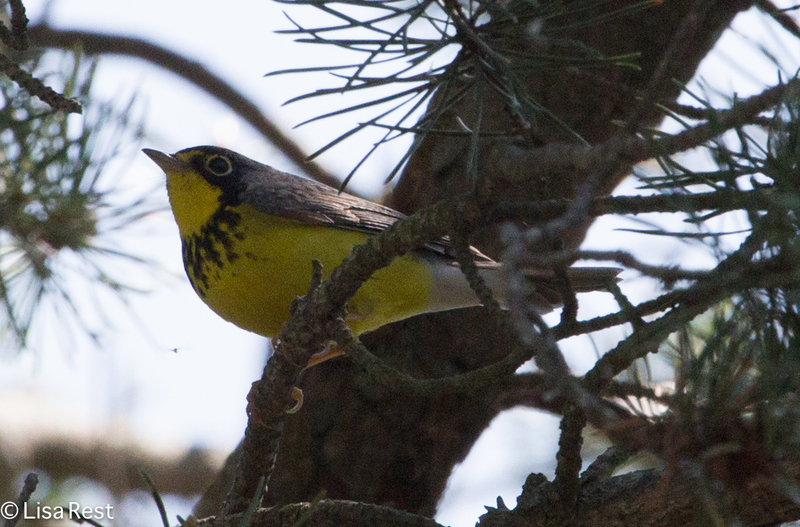 While I want to put a more representative selection up on my flickr page, for the moment I am sharing some warbler pictures here. 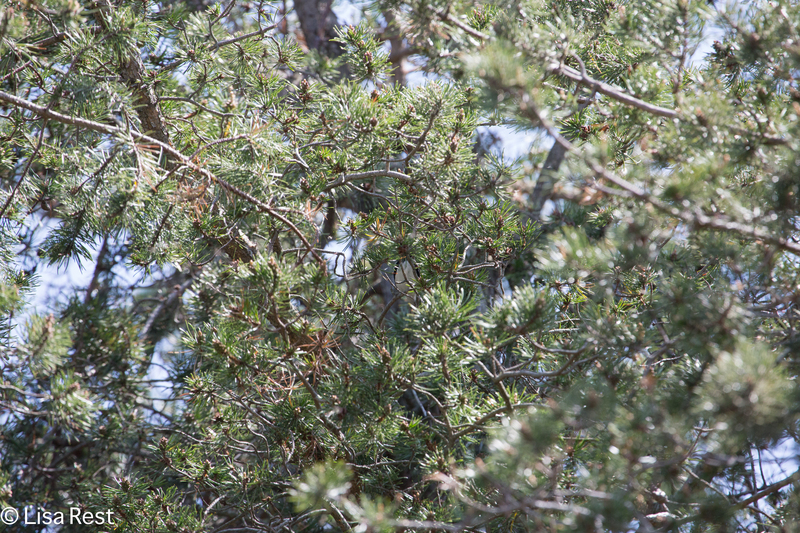 Most of the birds were far enough away that I had to use manual focus to follow them around as they flitted through pine needles. With some photographs it was like reliving getting on the bird in the first place – where is it? 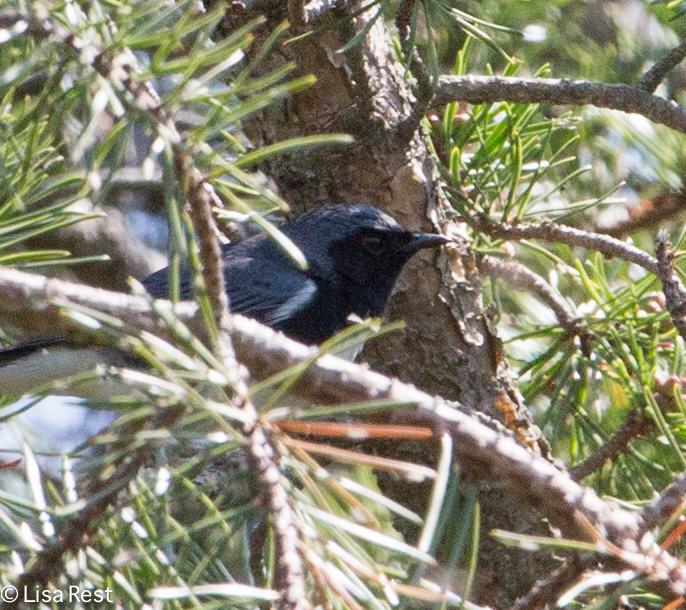 A Black-Throated Blue male was definitely on my list of must-sees and although he proved a bit difficult to photograph in the bright light against the sky, he stuck around for more photographs than I care to admit. 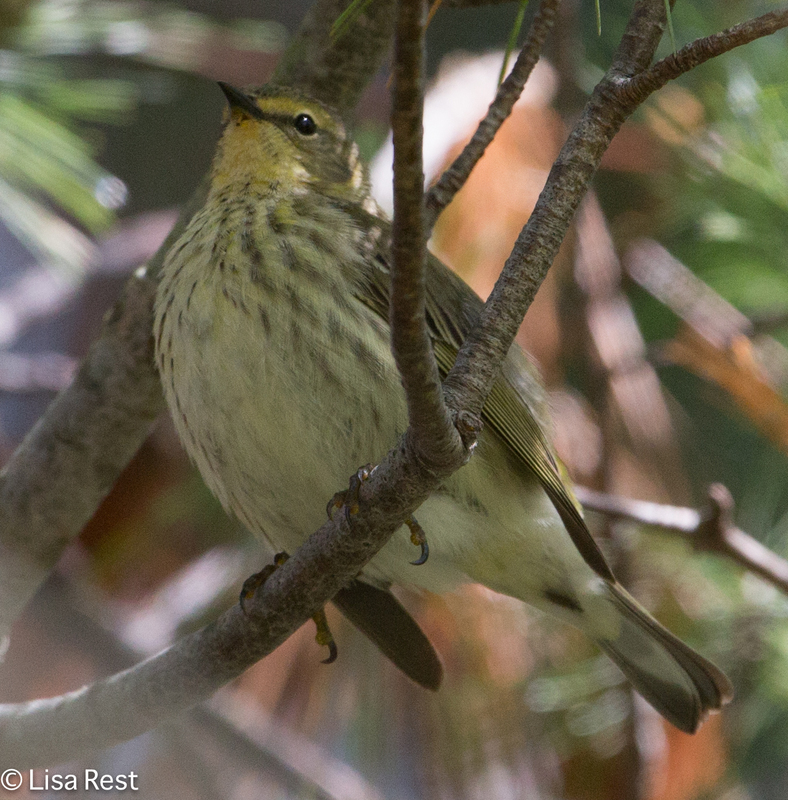 The female Cape May Warbler above caused a little confusion until we could be sure all her markings were in the right place. Here is a picture to prove it. 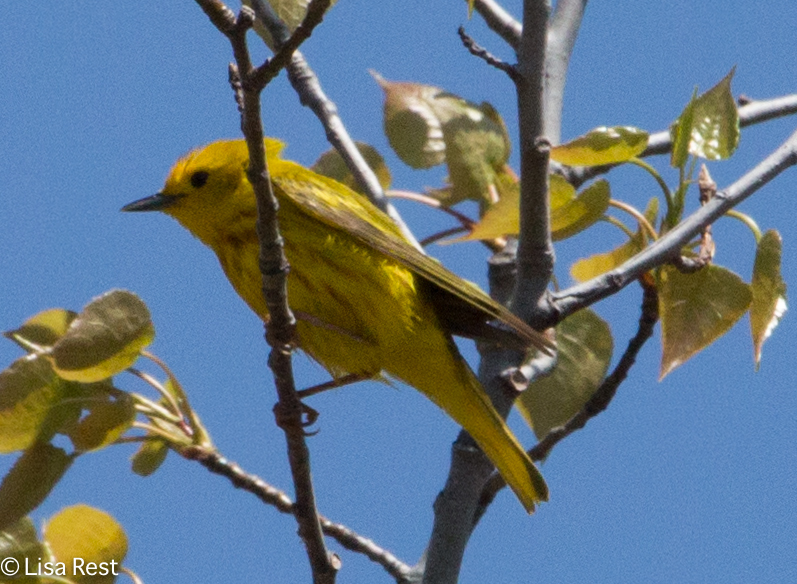 Yellow Warblers abounded, even windblown ones. 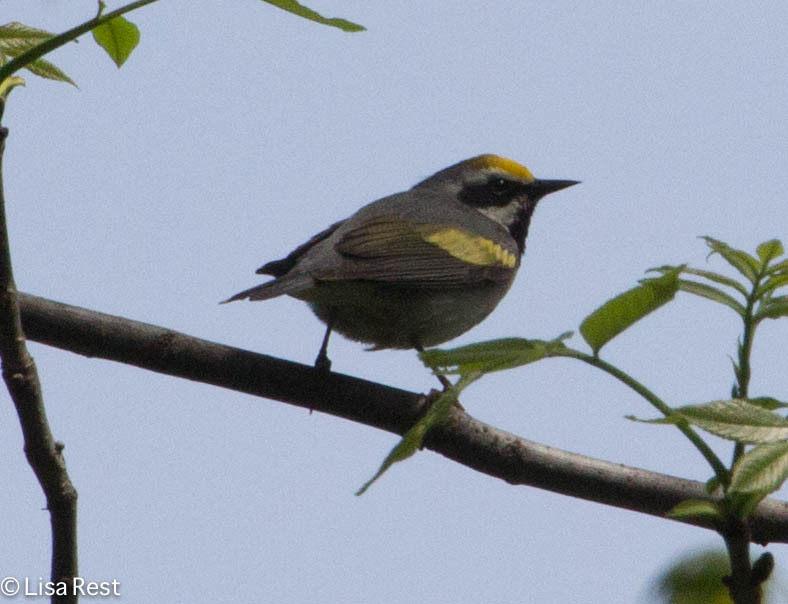 It seems increasingly difficult to find Golden-Winged Warblers, and the sunlight proved to be a challenge, but if you click on the second picture above you might be able to see the golden wing field mark a little better. 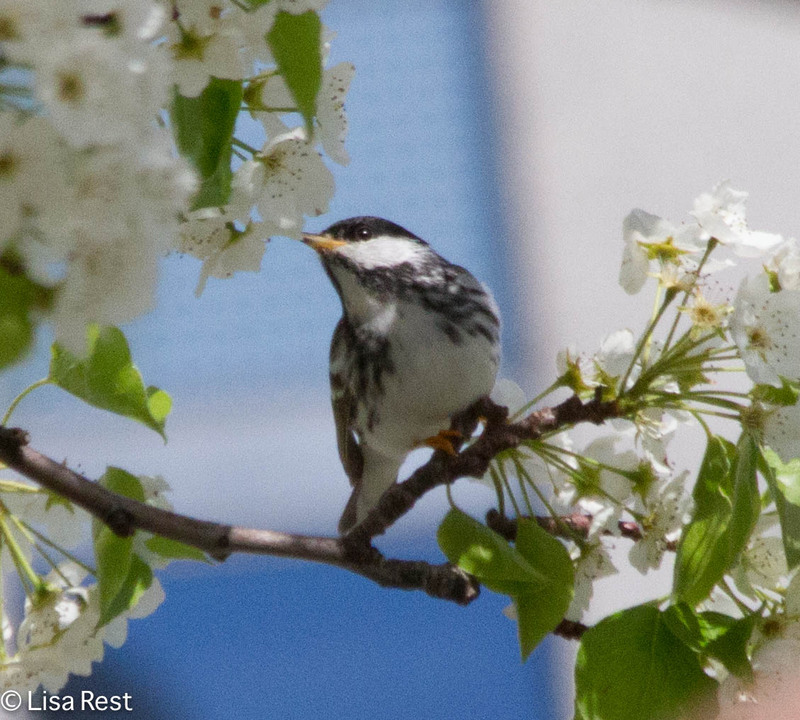 Magnolias and Redstarts are common enough but each individual has something different to offer. 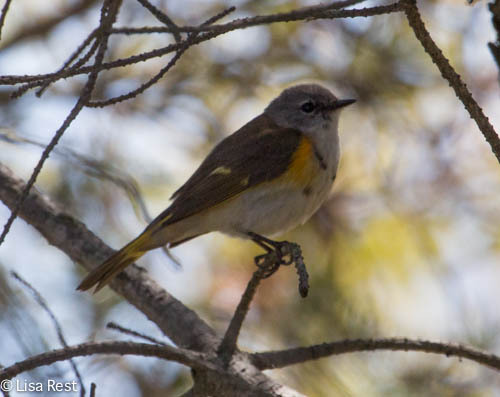 I like the way there is a hint of black coming in on the first-year American Redstart below. 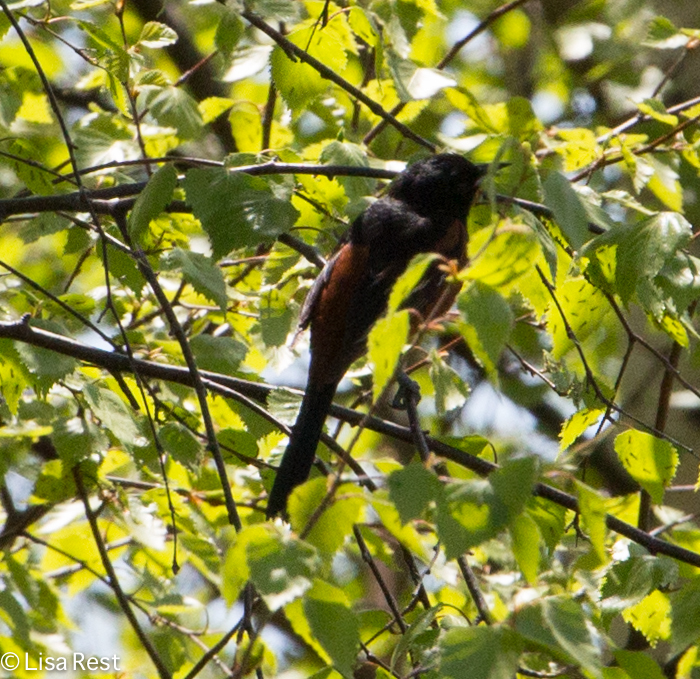 Next year he will be all black except for the orange on his breast, like the male below him. 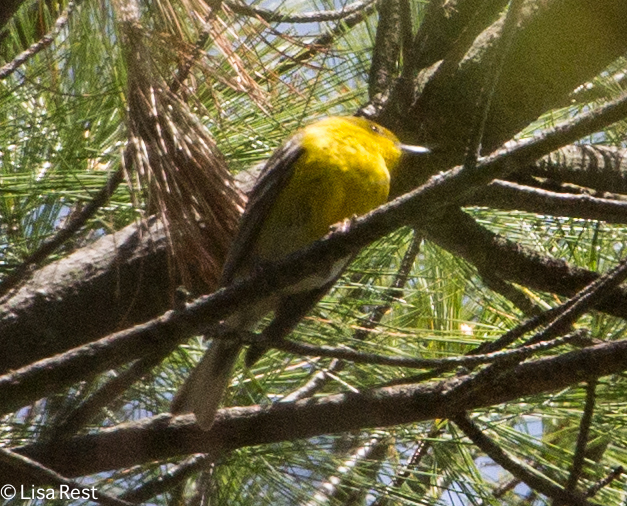 I have never seen a Pine Warbler well enough before, which makes me think until this trip I never really saw one. Now I can add it to my list! 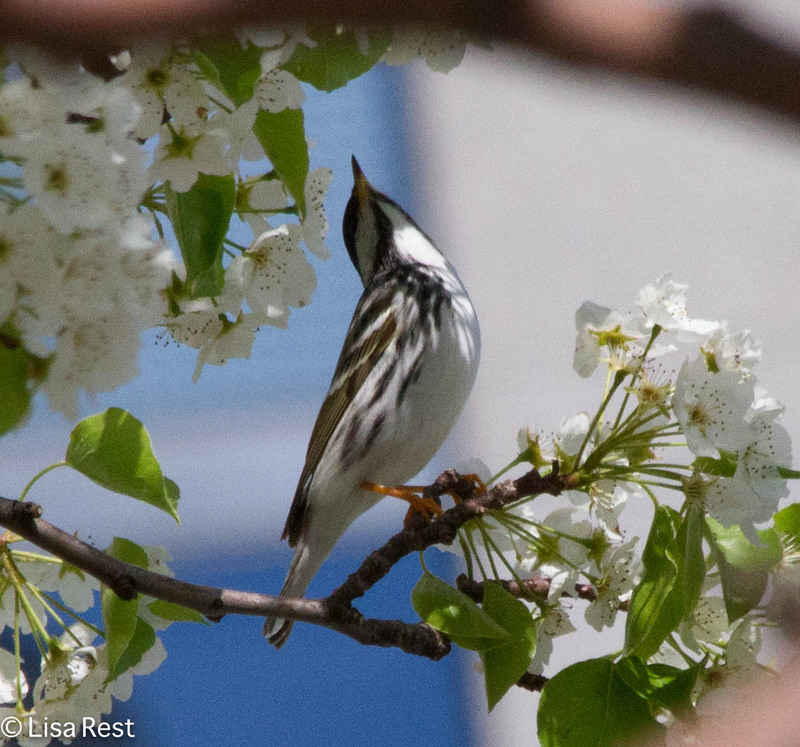 Black-Throated Green Warblers are always welcome. 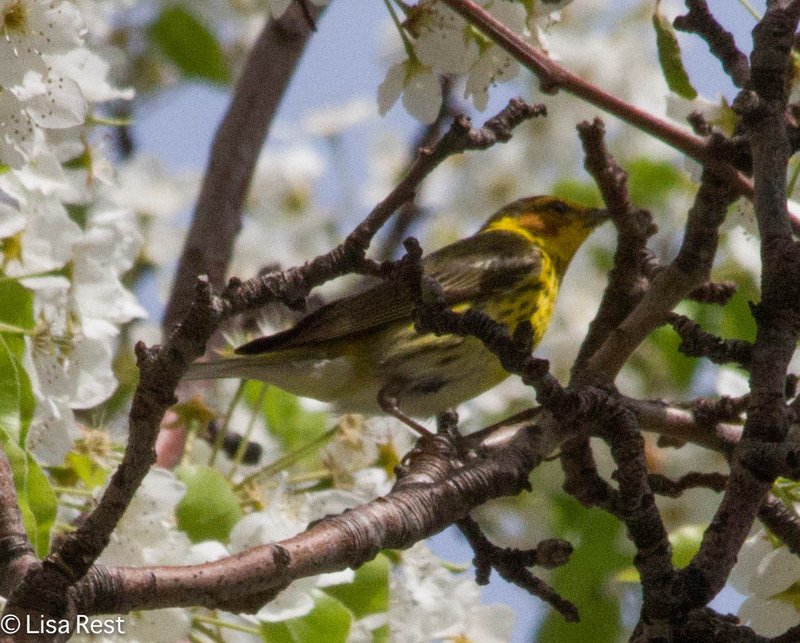 And another species that had eluded me this spring finally came to light: the male Canada Warbler. I did not break into the “Oh, Canada” refrain from “A Case of You” by Joni Mitchell as is my wont whenever I see one of these birds, but he might have heard me anyway. 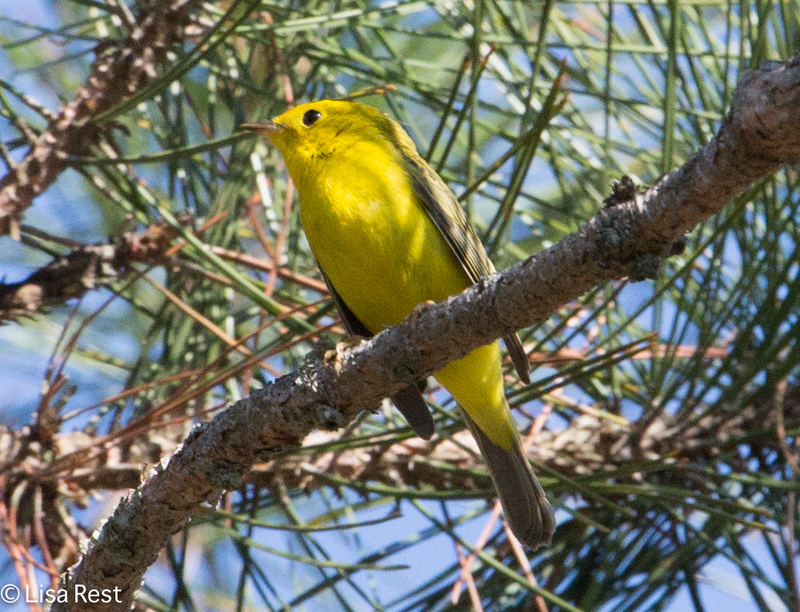 All the research done lately points to people finally discovering that birds are indeed a lot smarter than we ever gave them credit for. My personal theory is that somewhere along the line people realized certain birds were smarter than they were and started on that “bird-brain” campaign to make them appear inferior. Now if somebody calls you Bird Brain, take it as a compliment! For all the attention I’ve been paying to birds lately I’d like to think some of their smarts have rubbed off on me… But it’s hard to think about anything else, so I don’t know how that computes. 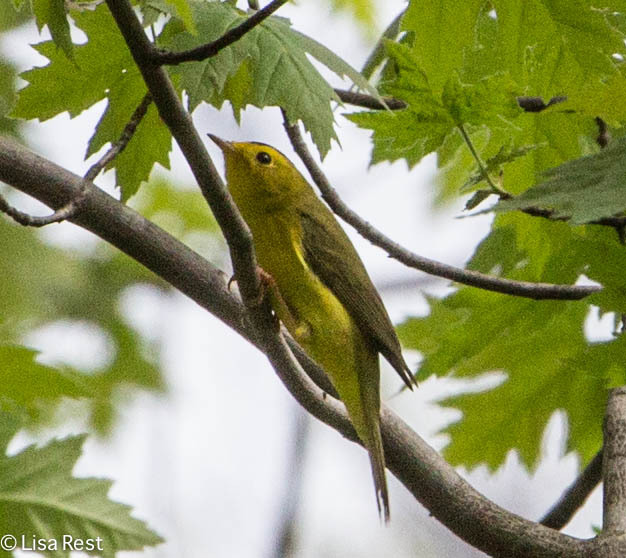 This post features photographs of warblers taken late last week downtown and at LaBagh Woods Forest Preserve on Sunday. 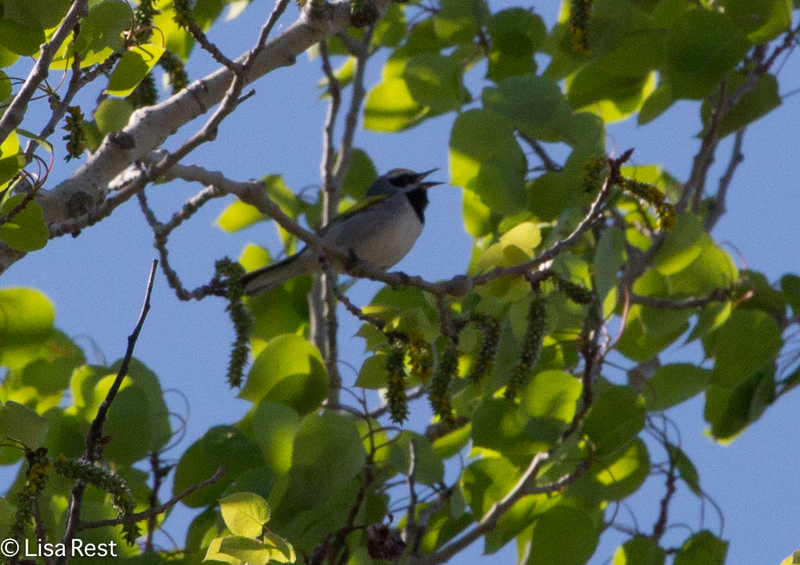 The Black-Throated Blue above came as a surprise when I was going through the photos last night, as it was in a small flock containing Wilson’s and Magnolias and I was just trying to capture anything that moved. The morning started out very slow at LaBagh, it was cool and cloudy, but I stuck it out and later as the sun came out the birds did too. We had two days of hot spring and now we’re having cold, almost March-like weather. So I’m trying to cheer myself up a little bit with brightly-colored birds. Perhaps two of the best were downtown last Thursday at the Aon Building. 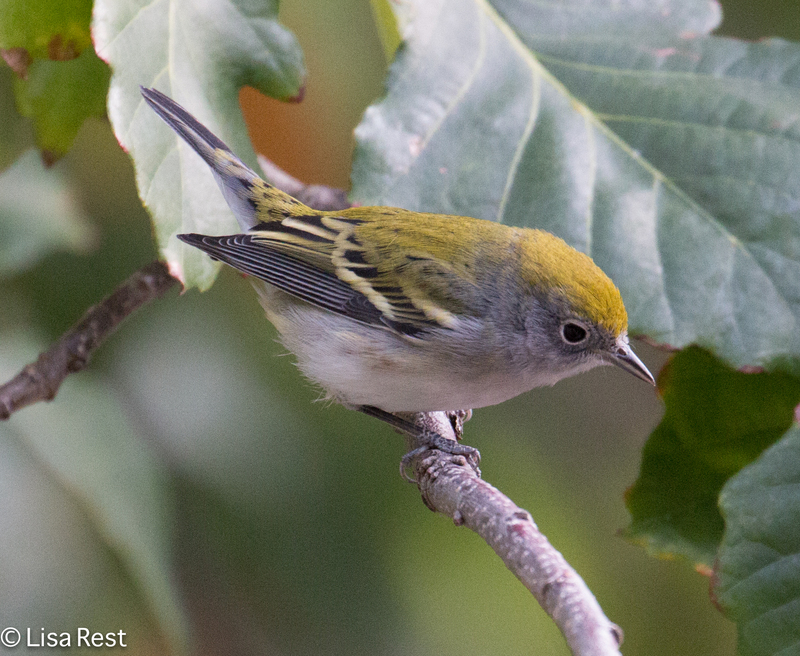 Some of these guys don’t appear fully molted out into their brightest colors, but it has been a long time since I’ve seen a Golden-Winged Warbler. The flowers are all gone from these trees now, but for a moment we had spring. There are more photos to discover, and I hope to be back with them soon. In a way it’s good the weather is so awful I’m not out taking more pictures, so I get a little catch-up time. 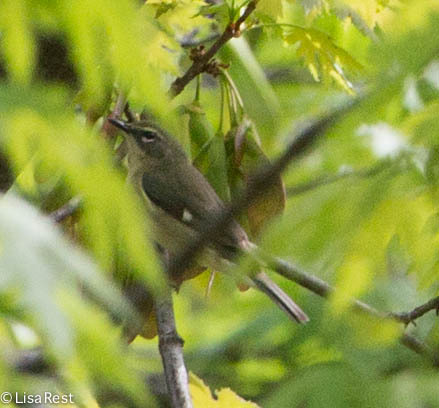 The last couple weeks of fall migration, warblers and others have been following the sapsuckers as they drilled holes in the rows of homestead elms lining either side of the center “naturally planted” section of Daley Bicentennial Plaza. The birds are drinking sap from the wells drilled by the woodpeckers. 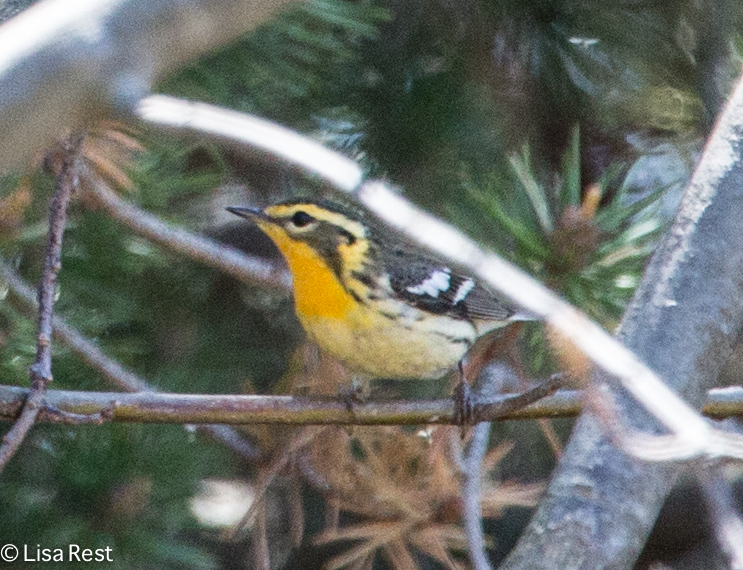 We are still seeing Orange-Crowned Warblers and Yellow-Rumped Warblers. 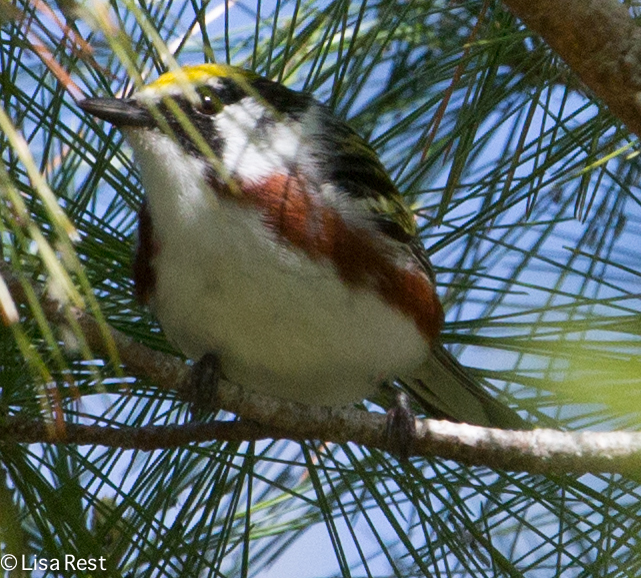 The Yellow-Rump below was putting on quite a show when I took this picture last week: he kept hovering around his favorite saphole like a hummingbird. 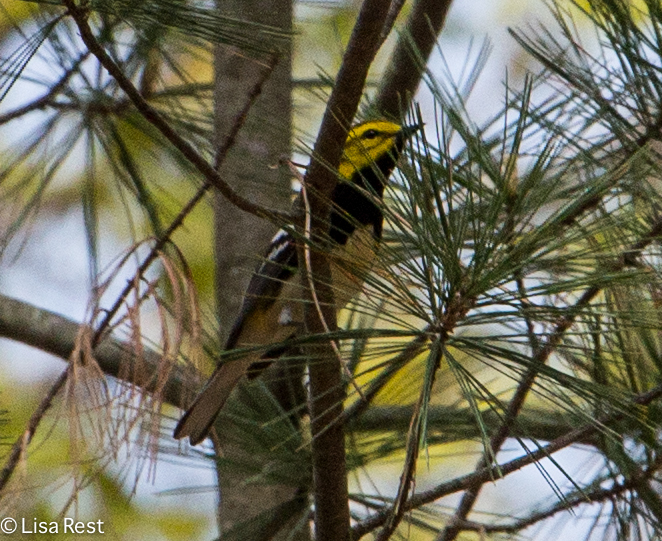 The Tennessee Warblers like the one below are sometimes confused with Orange-Crowned, especially this time of year. There have been a lot of Red-Breasted Nuthatches this fall, and the one below, drinking sap, is no exception. 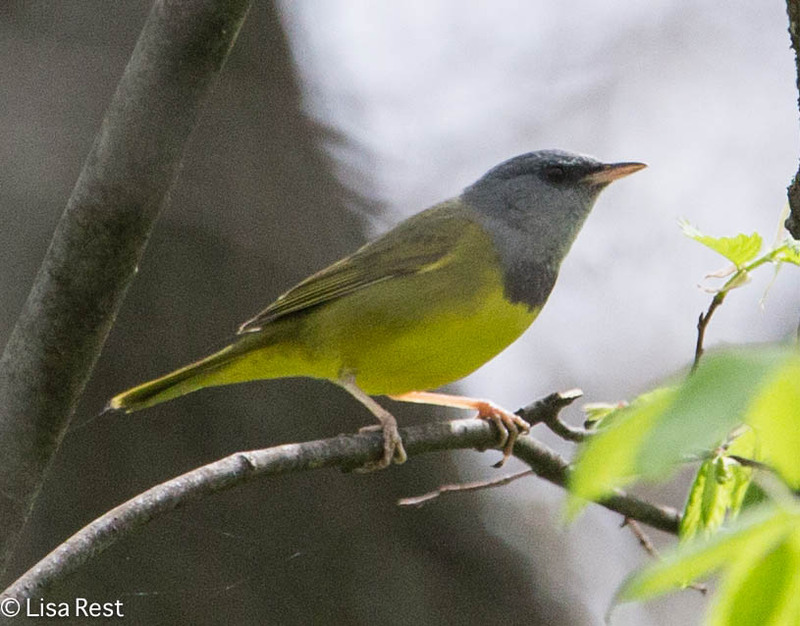 Some of the first warblers noticed were Black-Throated Blues. 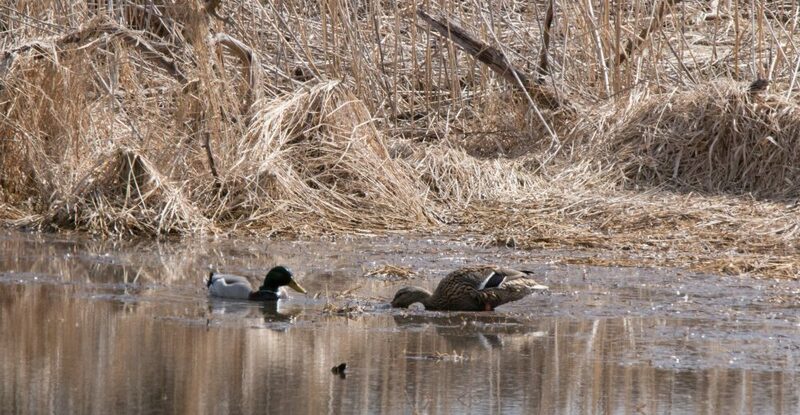 Here’s a female, and below her, a male – although I did not get a picture of him drinking, it’s almost a wonder he let me photograph him at all. He behaved like a celebrity tired of paparazzi. 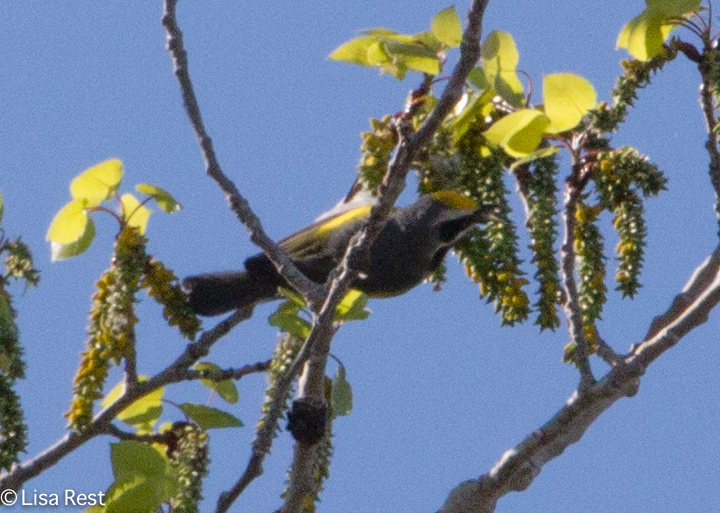 Cape Mays aren’t always cooperative either. 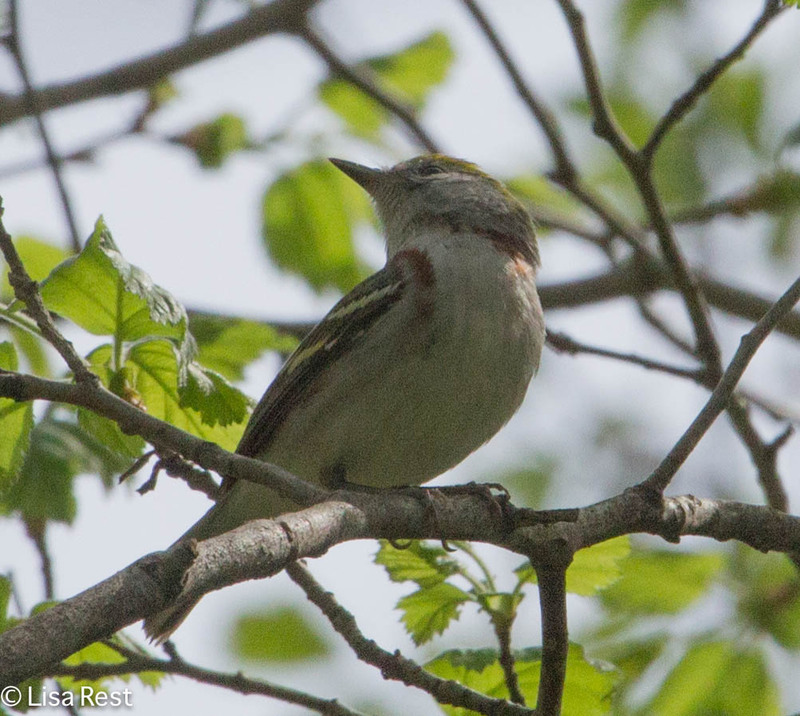 I took several pictures of this Ruby-Crowned Kinglet yesterday, but the midday sun was brutal and I discarded most of them. There could still be a lot of sapsuckers coming through…and following them, their fans of many colors and configurations. 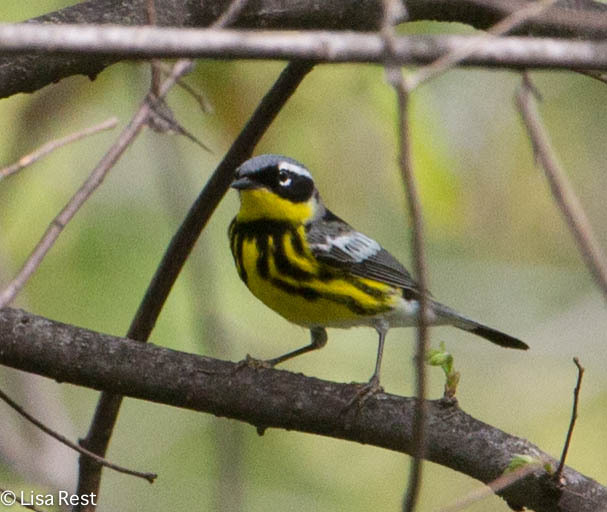 But as the leaves disappear…so will these migrants.